Main Point: God Freed me From All My Fears! When I’m Scared, I Pray! When I’m Scared, I Will Trust Jesus! When I’m Scared, God Keeps Me Safe! When I’m Scared, God Is With Me! When I’m Scared, God Gives Me What I Need! When I’m Scared, Jesus Can Heal! When I’m Scared, God Helps Me! This weekend, our friends MiMi and MoMo Monster were eating in the kitchen when our Agent Lou True visited them. But when he arrived, he found laughing monsters instead of scared monsters! Mimi and MoMo Monster told Agent Lou True there had no fears, but they would love to hear a story from the Bible. He read a story about a man named David and the special song he wrote about how much God loves us. This special song helps us remember even though we are scared, God is always with us and takes care of us. After hearing the Bible story, MiMo and MoMo told Agent Lou True they didn’t have to be scared because they KNOW God is always with them and taking care of them. God frees us from all of our fears, just like he freed David from his fear of fighting the giant Goliath to save his people! In this week’s truth bag was a band aid! MiMi was afraid the boo-boo on her head wouldn’t heal, but we helped her BUST her fear with a story from the Bible. MiMi learned she shouldn’t have been scared of going to the doctor and her boo-boo not healing – Jesus can heal! Use the truth card to start a discussion with your child about their fears and to review the Bible story and main point. 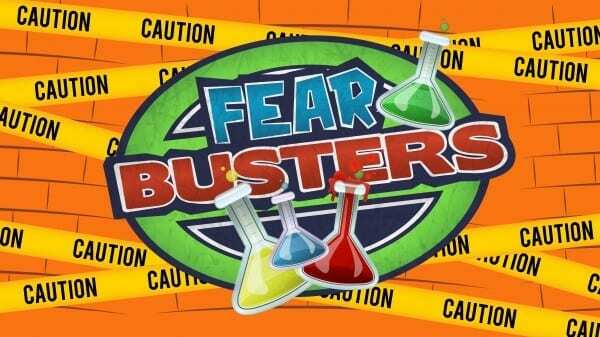 Our memory verse during FearBusters teaches us that God can free us from all our fears. Children have one more weekend to recite the memory verse for a ROAR-some monster prize in Quest.